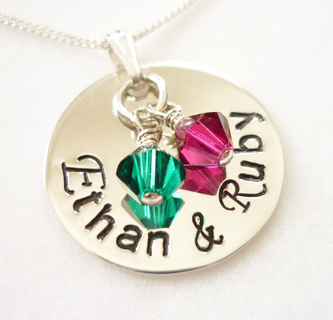 Striking and eye-catching, these thick, sturdy personalised, hand-stamped sterling silver pendant necklaces feature Swarovski birthstone crystals - pick your’s or your child’s birth month, month of remembrance or simply a favourite colour. Names and dates of special occasions are usually stamped into pendants, however you are not limited to this and if you have a favourite short motto or couple of words you’d like to wear close to your heart, we’ll endeavour to accommodate your request. A sterling silver chain in your chosen length completes a stunning, unique piece of keepsake jewellery. ALTERNATIVE FONT STYLE AVAILABLE - Monotype Corsiva (upper case letters only). Perfect as an elegant first letter of any name or for just initials! If you'd like this font, please request this in the Special intructions box.